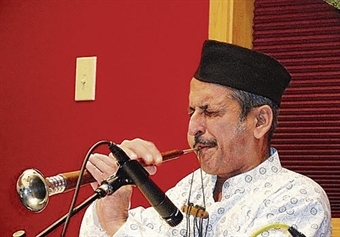 Flute Concert by Pandit Rajendra Prasanna, exponent of the flute and shehnai. Recipient of the Uttar Pradesh Sangeet Natak Akademi Award (1995) Accompanists: Rishab Prasanna (flute) and Shubh Maharaj (tabla) 53rd Spirit of India 2015: 15th Margaret Dhillon Memorial Concert organised in collaboration with the Natraj Cultural Centre, Melbourne Venue Name: Fountain Lawns. 06.30 PM. Venue: India International Centre, 40, Max Muller Marg, Lodhi Estate, Delhi. Hindustani Vocal Recital by Omkar Havaldar, disciple of Dr.Nagaraj Rao Havaldar. 07.00 PM. Venue: India Habitat Centre, Lodhi Road, Delhi. Smriti - An Indian Classical Music & Dance Festival Shehnai recital by duo Sanjeev & Ashwani Shankar Followed by Kathak recital by Namrta Rai. Collab: Rhythm. 07.00 PM. Venue: India Habitat Centre, Lodhi Road, Delhi. Smriti - An Indian Classical Music & Dance Festival Jugalbandi Bhaskar Das (Bansuri) & Rohan Dasgupta (Sitar) Followed by Odissi recital by Aruna Mohanty. Collab: Rhythm. 07.00 PM. Venue: India Habitat Centre, Lodhi Road, Delhi. Hindustani Vocal Recital By Dr. Nagaraj Rao Havaldar from Bangalore, disciple of Guru Pt. Panchakshari Swamy Mattigati and Pt. Madhav Gudi. 06.30 PM. Venue: C.D. Deshmukh Auditorium, India International Centre, 40, Max Muller Marg, Lodhi Estate, Delhi. Sarangi recital by Ahsan Ali, disciple of Ustad Asaf Ali Accompanist: Amaan Ali (Tabla). Followed by Duet by Fateh Ali Khan (Sitar) & Rajesh Prasanna (Flute) Accompanist: Arshad Khan (Tabla). Concludes with an Odissi recital by Sandhya Manoj, disciple of Guru Durga Charan Ranbir. 07.00 PM. Venue: India Habitat Centre, Lodhi Road, Delhi. Vocal recital by V. Jyothi Sridevi from Andhra Pradesh, disciple of Voleti Venkateswarulu. 10.00 AM. Venue Name: C.D. Deshmukh Auditorium, India International Centre, 40, Max Muller Marg, Lodhi Estate, Delhi. Shradhanjali: Classical Indian Music Festival - Day 2. 11.00 AM Concert Ustad Hashmat Ali Khan (tabla) with his grandson Salil Bhatt (mohan veena) with Pranshu Chaturlal (percussion) At 18:00 Concert Jugalbandi by Roopak Kuklarni (flute) and Kawalaya (vocal) Jugalbandi by Zahid Khan (vichitra veena) and Nasir Desai (surbahar). Venue Name: C.D. Deshmukh Auditorium. India International Centre, 40, Max Muller Marg, Lodhi Estate, Delhi. Lok Kala Manch In association with Swaranjali Presents An evening of Indian Classical Music. Hindustani Classical Vocal Music Dr. Mrs. Tanuja Nafde - Hindustani Light Classical Vocal Music. Accompanied by Pt. Jitendra Swain - Tabla, Pt. Damodhar Lal Ghosh - Harmonium and Pt. Ghanashyam Sisodia - Sarangi, Solo Sitar Sh. Subrata De - Sitar ; Accompanied by Sh. Pradip Kumar Sarkar. 06.00 PM .Venue: Vasuki Auditorium, Lok Kala Manch Institutional Area, Lodhi Road, Delhi. Shradhanjali: Classical Indian Music Festival - Day 1 Concert Jugalbandi by Saeed Zafar (sitar) and Saraswati Rajagopalan (vichitra veena) Jugalbandi on tabla by Ustad Akram Khan & Pt. Ram Kumar Mishra Venue Name: C.D. Deshmukh Auditorium. India International Centre, 40 , Max Muller Marg, Lodhi Estate, Delhi. Sitar Recital by Dr.Birendra Nath Mishra Followed by Hindustani Vocal recital by Pt.Bhola Nath Mishra. 07.00 M. Venue: India Habitat Centre, Lodhi Road, Delhi. Aayush Mohan Gupta (Sarod), Lakshay Mohan Gupta (Sitar) & Anuradha Pal (Tabla). Jugalbandi Aayush Mohan Gupta (Sarod), Lakshay Mohan Gupta (Sitar) & Anuradha Pal (Tabla). 07.00 PM. Venue: India Habitat Centre, Lodhi Road, Delhi. With Agra gharana vocalist Janab Waseem Ahmed Khan (Khayal) Initiated into ta'lim by his maternal grandfather Ustad Ata Hussain Khan, Janab Waseem Ahmed Khan has had the good fortune of learning with his father Ustad Naseem Ahmed Khan & uncle Ustad Shafi Ahmed Khan of the Agra gharana. In keeping with the rich repertoire of the gharana, he will present rarely heard ragas and bandish-es. Venue Name: C.D. Deshmukh Auditorium. 06.30 PM. Venue: India International Centre, 40, Max Muller Marg, Lodhi Estate, Delhi. Krishna Rang - Flute recital by Pt.Ajay Prasanna, Light Classical vocal recital by Vidhi Sharma & Kathak recital by Mahua Shankar.07.00 PM. Venue: India Habitat Centre, Lodhi Road, New Delhi. Pt. Amarnath Barsi Music Festival - Day 1. Vocal Recital by Vidushi Bindu Chawla Qawwali by Warsi Brothers and Group Venue Name: C.D. Deshmukh Auditorium. 06.30 PM. Venue: India International Centre, 40, Max Muller Marg, Lodhi Estate, Delhi. Habitat Concert Series- Dhrupad recital by Pt.Naval Kishore Mallick Hindustani Vocal recital by Pt.Channulal Mishra. 07.00 PM. Venue: India Habitat Centre, Lodhi Road, Delhi. HCL Concert Series presents Concert by Rama Sundar Ranganathan (Hindi Classical Vocal). Accompanied on tabla by Vinod Lele and harmonium by Vinay Mishra.07.00 PM. Venue: India Habitat Centre, Lodhi Road, Delhi. An Evening of Argentinian Music - Piano recital by Mariano Vasquez, well known pianist and tango dancer. The artist will present a selection of tango music by well-known Argentinian tango music composers including Astor Piazzolla, Ernesto Poncio, Homero Exposito, Carlos Di Sarli and Atahualpa Yupanqui Venue - C.D. Deshmukh Auditorium. 6.30 PM. Venue: India International Centre, 40, Max Muller Marg, Lodhi Estate, Delhi. Tigalbandi Pt.Vishwanath and Manu Maharaj (Vocal) & Bhaskar Nath (Shehnai). Followed by Solo Tabla recital by Ustad Sabir Khan. Sitar recital by Ustad Shahid Pervez. Collab: Baba Vishwanath Society. 0.00 PM. Venue: India Habitat Centre, Lodhi Road, Delhi.